It is the last day of February. Can you believe that? 2 months have already gone by in 2013. Where has the time gone? 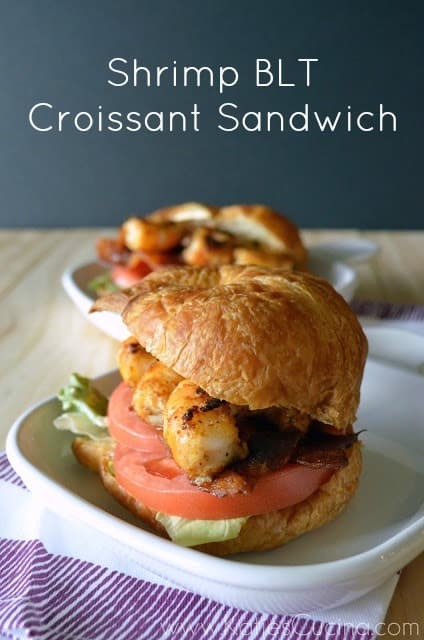 Lets take a minute and savor the time… and make some quick Shrimp BLT Croissant Sandwich. First off, these sandwiches are amazing in so many ways. Secondly, they are super easy to make. Third, you will impress anyone who you serve this too. I’ve made these a handfull of times since creating the recipe last summer. I photographed last summer, too. But now that I’ve really been working on my food photography and styling I had to remake the sandwich to rephotograph it. And then of course indulge on a Shrimp BLT Croissant Sandwich after the “shoot”. Hard job… right? I dropped off two of these sandwiches along with some fabulous Jambalaya to my parents the other weekend. They had been traveling and I knew they would need dinner that night and lunch for work the next day. I was reluctant to wrap up these sandwiches not knowing how they would fare the next day. Let me tell you… I guess they were A-ok because I got not one but two phone calls from both of my parents raving about this sandwich. They love their BLT’s and I guess I’ve introduced them to the next level of BLT’s. My husband not being a big fan of bacon isn’t a huge fan of BLT’s but he will eat it this way! Seriously, jazz up that plain old BLT! 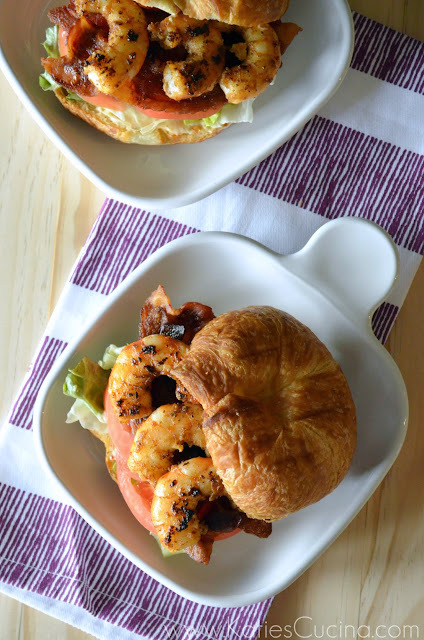 Jazz up the plain-jane BLT with a croissant and shrimp! This new twist on a classic is sure to have everyone yearning for more! In a frying pan on medium-high heat, add the unsalted butter. Cook for 1 minute or until the butter has melted. While the butter is melting toss the old bay seasoning with the shrimp. Place the seasoned shrimp in the frying pan and cook for 3 minutes (turning once to brown both sides). Once the shrimp has been thoroughly cooked remove from heat. Toast croissants, slice in half and slather a healthy amount of Smoked Chipotle Aioli Sauce on each side of the croissant (about 1 tablespoon per croissant). Then line the bottom of the croissant with butter lettuce, sliced tomatoes, and bacon. Top with cooked shrimp and croissant top. Enjoy immediately or wrap in plastic wrap, store in the refrigerator for up to one day! Kaite, this looks fab! My husband would LOVE this! He loves croissants and is a huge shrimp fan too. Yummy!! I’m new to your blog and I love it!! Awe thanks Gerry, I’m honored! I agree… we should create the sandwich Smithsonian! Brilliant idea! mmmm what a good idea! I don’t think I would have ever thought of that! So simple but I bet it’s amazing! Angie–that is exactly what my mom said. Both my parents couldn’t get over the simplicity of the sandwich! This sounds incredible! 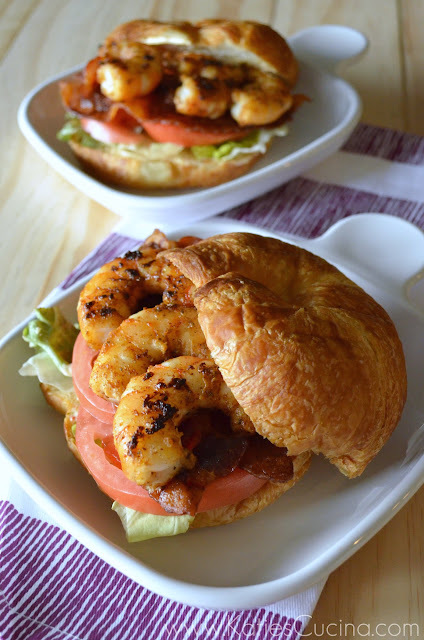 I’m a fool for BLT and I love the addition of shrimp! Cassie I love them too, but sadly my husband isn’t a big fan (until this sandwich)! I am seriously drooling over here, Katie! Love this idea 🙂 Lovely photos too! Thanks Addie–now go make one! This. Looks. Amazing. So creative! This is my kind of BLT! Love the addition of shrimp! A shrimp BLT? I’m all over this plan! It sounds divine. Thanks Mary! Divine it is! I love my BLTs, too…and adding shrimp was pure genius!!! What a sweet daughter you are!!! I can’t believe he doesn’t like bacon? What a travesty 🙂 At least he will eat it this way. Looks so good. I’m having shrimp tonight for dinner and this made me even hungrier. Terri–I know… something is clearly wrong with him!! Oh…how delicious. I love BLTs and shrimps. And you really did combined the best of both in a lovely package. Yes, we food bloggers sure got tough job…tasting and testing recipes, and “indulge” after the shoot. 😛 Your food styling and photography are both amazing, very inspiring. Thanks for sharing and I can’t wait to try these sandwiches out. Thank you Amy for the kind compliments! I love all things BLT! Oh yum!! I have two croissants in my freezer. Now I know exactly what to do with them! Yvonne, thanks for stopping by and leaving a comment! I think you should definitely make these!!! I am 110% drooling over this!